Well, friends, Welcome to the Round of the Saintly Sixteen. We started with 32 holy men and women and we’re down to sixteen as the battle for the coveted Golden Halo marches on. Round One consisted of basic biographical information about the saints. Since there’s no need to rehash previously covered ground, the this round is made up of what we like to call “Quirks & Quotes.” So prepare for some little known facts accompanied by quotes either by or about the saint in question. In the final battle of the initial round, Paul of Tarsus handily defeated Theodore of Tarsus 61% to 39%. Check out the updated bracket to see the full slate of saints who made it to the next round. We kick things off with the much-anticipated match-up between Joan of Arc and Mary Magdalene. This battle has been hyped so much that it would make even Don King blush. But the waiting is over; let the voting commence. Winner heads to the Round of the Elate Eight! Joan of Arc (1412 – 1431), a French peasant, began to hear the voices of Saints Michael, Catherine, and Margaret at age thirteen. By seventeen, those voices urged her to become involved in the struggle for the contested French throne in the Hundred Years War. She convinced Charles the Dauphin to allow her to command an army, which she led to spectacular victory in Orleans, paving the way for him to be crowned king. She was later wounded in battle and then captured, sold to the English, and put on trial by the Inquisition. Tried as a witch and a heretic but finally convicted of cross-dressing, she was burned at the stake at nineteen. Joan was led by her voices to find a sword buried behind the altar in a church in Tours. It had five crosses on it and was covered with easily removed rust. “I loved that sword,” she testified, “because it was found in the church of St. Catherine [of Fierbois], whom I loved.” She only actually used the sword, however, to whack the backs of trollops while running them out of the army camps; during battles, it resided in one of its three special sheaths, while her hands were busy with her horse and her banner. “I loved my banner forty times better than my sword. And when I went against the enemy, I carried my banner myself, lest I kill any. I have never killed anyone,” she said. Joan inspired hundreds of books, plays, musical compositions, movies, and all kinds of art. Mark Twain, not normally known for his religious sentiments, declared that his biography of her was his best book and said of her: “Whatever thing men call great, look for it in Joan of Arc, and there you will find it.” Sir Arthur Conan Doyle declared that “…next to the Christ, the highest spiritual being of whom we have any exact record on this earth is the girl Jeanne.” “She chose a path, and went down it like a thunderbolt,” said an admiring G.K. Chesterton. Best known, probably because it has been depicted for centuries, is the story explaining why Mary Magdalene is often shown in Western and Eastern artwork holding a red egg. According to this legend, Mary Magdalene’s story about Jesus’ resurrection was challenged by the Roman emperor Tiberius. When he insisted that no one could rise from the dead any more than an egg could turn red, she picked an egg up from the table; it turned red. Today, Eastern Rite Christians honor the story by coloring Easter eggs bright red. Other less known (perhaps suppressed?) legends have her traveling with John (the other beloved) after Mary, the mother of Jesus, died circa 54 CE. These legends not only have Mary and John on a road trip to Ephesus, visiting newly established churches along the way, but also have them living together for a while. Before deciding the prize for most incredible legend should go to the red egg story, consider these phantasmagorical ones about a cave in France and the Holy Grail. Legends have Mary Magdalene traveling to Gaul after leaving Asia Minor. Once there, she is believed to have spent a period of time teaching and preaching in Marseilles. To recuperate from that gig, she turned to a more contemplative life of prayer and meditation in a cave in the Sainte-Baume mountains. But according to these legends, a band of angels transported her daily so she and Jesus could spend time together. Holy hoist! Last but not least are stories about the Holy Grail, the cup from which Jesus drank during the Last Supper . . . or was it the cup held up at the foot of the Cross by Joseph of Arimathea to catch blood streaming from the wounds of our dying Lord? Both? There’s some dispute about whether Joseph or Mary Magdalene held the cup at the foot of the Cross, but legend-weavers seem to agree that Mary brought the “sangraal” to the Southern coast of France circa 42 C.E. In some instances, legends about the “sangraal” (Holy Grail) have morphed into legends about the “sang rall” (Holy Bloodline), which insist the “vessel” was not an actual cup, but Mary Magdalene herself, wife of Jesus and mother of royal offspring from the Davidic bloodline. Here’s what’s not legend or myth: the Risen Christ first appeared to Mary Magdalene and entrusted her with the task of telling the disciples she had seen the Lord. 91 Comments to "Joan of Arc vs. Mary Magdalene"
Hope and Skye: This close to Easter, go with the Golden Egg! We had open dissent at breakfast this morning. 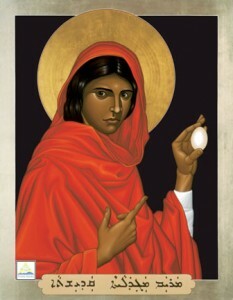 The egg story might tip things over to Mary, though…. Today voting is easy. I have a friend who says that Joan d ‘Arc is the only person who reached sainthood for killing English. I think that that poor girl needed a lot of psychological help. I vote today for the woman who was the first to see the resurrected Jesus. Regarding who needed psychological help, I would suspect that most psychologists would find it at best a toss-up between the girl who claimed to hear the voices of saints and the woman who claimed to see a dead man walking around in the flesh. I have to agree with you on that. I have never heard the expression “toss-up”. However, I grasp the meaning from the context. I find Tom’s reply quite funny, and thought I might also point out that you need to read the article more thoroughly next time. Joan never actually killed anyone. Nonetheless I quite like mary magdalene. I hate having a hard time deciding who to vote for. In New Orleans, there is a golden statue of Joan of Arc. She stands on a busy French Quarter street with her sword and armor. In the bright morning sun, her brightness may carry your soul into the presence of the beatific vision. Jesus’ heart is with Mary Magdalene, and my heart is with the Maid of Orleans. The hometown girl has my vote today. JOAN OF ARC. And for 25 years my bedroom was below the room where Joan recognized Charlie hiding out among his courtiers (in Chinon) – I too go for our hometown girl! Where are the little stickers that say “I voted today”? So the story begins again, Mary Magdalene starts her journey to lead us all to think about Jesus and the sacrifice he made for us to bring us into the new world. A world were each of us has a close person friend bringing God into our life to share and help with all our cares and our joys. A…! Not even close. Evangelist vs. warrior? I’ll take evangelist. Joan didn’t fight, she just pushed the troops forward. Remember that. Much as I admire Jeanne, and the fact that she ran trollops out of camp with the magnificent sword–Mary and the red egg have me today. Mary, the woman at the tomb, the woman at Christ’s side throughout his ministry. The female apostle. She gets my vote! Looking for her to make it to the Golden Halo! Me too! Would be grand for the Apostle to the Apostles to win!! Me three! And very nice post about Mary M. today — Thanks for that. Meredith, I’m puzzled by your statement “we have no direct quotes from Mary Magdalene”. Isn’t the Gospel of John, chapter 20 full of direct quotes? I’m with you, ladies–Mary Mag all the way!! All the way with Ma-ray! The Golden Halo will be her compensation for all the centuries of bad press. I did not get my email today. Not in spam either. HELP! Me neither. SEC are you ok? I didn’t get mine either – is this a plot to keep me from voting?! We rely on WordPress to send the emails whenever there’s a new post. For some reason, unknown to the Supreme Executive Committee, this one did not go out to anyone. Best safeguard is to visit http://www.lentmadness.org sometime after 8:00 a.m. EDT every morning and vote. Maybe you will want to buy a special alarm clock dedicated to reminding you, just in case the email doesn’t show up again. Sorry for the inconvenience, everyone! I think it’s a conspiracy to suppress the Mary Magdalene vote. Call in Robert Langdon! Looks like I might get three in a row. Mary always facinated me with all the stories and legends that surrounded her; was she a prostitute (probably not), Jesus’ lover (how could Jesus be human without experiencing some human love) or just one who loved Jesus in a platonic way? Alas, we may never know. But what we do know was that she was the first to announce that Jesus had risen to the Apostles which makes her the first evangelist. Mary, you go girl! Of all the saints, including women who have managed to declared a doctor of the Church by the [adjective] Roman Catholic church, Mary Magdalene is the ONE who keeps me steadily faithful and focused on serving the risen Lord. I love Mary M, but I want Joan, a warrior in armor and sword to go up against Brigid, the patron of blacksmiths who make the armor and swords. That is a match-up this crazy warrior girl just cannot pass up! Vote for Joan! Let’s not forget the notion of Mary as female apostle or the Coptic text known as the Gospel of Mary (presumed to be Mary Magdalene). J never got my email. Thought I’d been excommunicatd. ‘I am not afraid. I was born to do this.’ And I could vote any other way? Interesting that Lent Madness voters rejected Thomas and James, two of the Apostles chosen by Jesus to serve with him and build the church, but are rallying around Mary Magdalene, who some call the Apostle to the Apostles. “Madness” seems to be the operative word here. Setting aside both legend and politics, here is the fundamental truth of the lives of the saints we vote for today: Mary was given a joyous mission – to be Jesus’ friend and to announce his resurrection to his friends; Joan was put to the ultimate test – to stand up for her faith and her love of God, all the way to a horrible death in the fire. I would not presume to say that God loved one better than the other – but Joan’s short (and documented) life is a stunning, if sometimes uncomfortable, example of faith in action. I respect Mary M, and love the story and legends, but I am voting for Joan. Tim –FYI for some reason, I was dropped from Lenten Madness and did not receive today’s match-up (Mary and Joan)…Tracked down and voted (only once) but curious as to why I “disappeared” in the email delivery. If you don’t get the email, go directly to the Lent Madness website to vote. This is the second time this has happened to me, but I didn’t miss a chance to vote either time. My vote to Mary Magdalene, and surprised to be on the other side from Lauren on this one. After the first round with Mary M, I read Cynthia Bourgeault’s book on her and am interested in the possibilities reclaiming her voice has for the church today. I voted for Mary M., but am surprised by the lopsidedness of the voting thus far. Sorry that you didn’t receive your fancy Lent Madness e-mail this morning. I have no idea why this happened (or rather didn’t) but I suspect Lent Madness gremlins. Or perhaps the ghost of St. Nicholas. Hopefully this won’t happen again. In the meantime, I suggest you post today’s match-up on Facebook, Tweet it, or send hard copy by carrier pigeon to help get the word out (of course I suggest you do that everyday as well). Thanks for your forbearance. We really could use a full-time Lent Madness administrator taking care of such glitches from a fancy office overlooking Central Park. I was sure I was dropped from the rolls for sending an e-mail extra Permalink. Of course I vote for her whose record is in the Sacred Scriptures and whom the BCP finally honors with a Red-Letter day. Remember that we already defeated Santa Claus. Think about what it means if we destroy Easter eggs. However, a person that sucessfully beats the Sassenach would be given the Golden Halo without further voting. Let me finish the thought…. …would be given the Golden Halo without futher voting in some parts of the world. Sassenach – what a great word. I was taught that you don’t say it, you sort of spit it out. The art alone by Donatello, as shown in the link to the Museum of the Duomo in Florence, explains why Mary Magdalene always will get my vote. Despite the fact that looks like the Joan statue just down the block from my parish, us Marys gotta stick together. Yes, this statue of Joan is in the traffic circle of my neighborhood in Portland, OR, a memorial to the fallen in World War I. I’m voting for Joan. 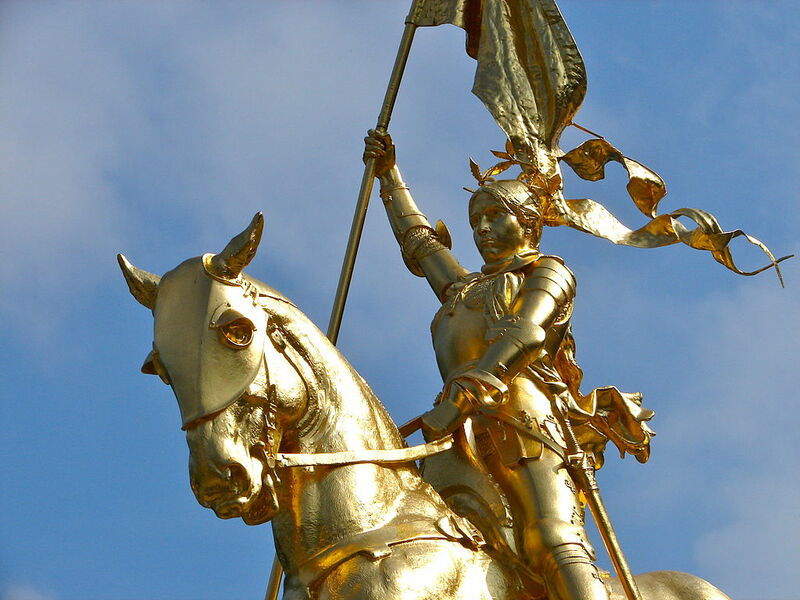 Joan of Arc had a heart…. Would she give it as a gift? Her body to the flame. I’ve previously expressed my uneasiness with these kiddie/teen females who see visions and show up with stigmata out of nowhere,,,,,yes, I know it’s supposed to be some sign of holiness. I simply have to go with the woman to whom the Risen Lord spoke and told her to tell the disciples of his resurrection from the dead. Of course, their totally ignoring her was the standard of the day that’s filtered down through the ages. Joan will probably get the most votes but visions and face-to-face encounters are not one and the same ! So, on to glory for Mary M., the Chosen and the Choice of our Lord ! By the by, I got dropped from my inbox, too, and just figured I’d ticked off somebody at the censor’s desk. And does Scripture ever say how old Mary Magdalene was? In their times, both Joan and Mary were actually women–of considered to be of marriageable and child-bearing age. Nonetheless, I had to cast my vote for MM. History has redeemed Jeanne d’Arc, but much of the world, including Christendom, still believes Mary to have been a fallen woman. Shabby treatment for Jesus’ beloved friend and the proclaimer of the resurrection, to say the least. It is long past time to fully rehabilitate her. BTW, I also did not get my E-mail today. All is not right in Christendom! Still stinging from Lancelot Andrewes’s loss to Joan awhile back, I have great pleasure in voting for Mary Mag!! Excellent write-up on fine, fierce Joan. As corrective to a tradition that somehow turned that encounter between Mary and the Risen Christ into a prohibition against women preaching or teaching, I vote for Mary Magdalene…with all my heart, as many times as I legally can! ” … goodly prize, fit for the devil’s grace! I think it’s fair to say, however, that overall Shakespeare presents her in a much more appealing light than one would expect! But Shakespeare does say that one day she will be the saint of France! Well, Shakespeare has Charles, Dauphin of France, say that. Those French boys, such flatterers! I have actually read a lot of Mark Twain’s book on Joan [it was a past life, I was a grad student]. I cannot describe how awful it is. She deserved better (and got it, from others), but for inspiring that book, I have to go with Mary. Ghost of St. Nicholas? Ghost??? Please don’t tell the children. Gotta go with Joan. Burned at the stake, people. Mary stayed with Jesus until the end. She faithfully visited his tomb every morning (BEFORE sunrise, even! ), instead of being “hidden in the house, afraid”. She refused to leave until she actually heard and saw her Lord again. And then she did exactly what Jesus asked her to do, being the first person entrusted with the Great Commission. ‘Nuff said. Didn’t get my email today! I’m sorry to have to vote for one or the other – I’ve been disappointed throughout that the bracket seems to have fewer saintly women than men, and then pits the women against each other to ensure they knock each other out of the running. Let’s see more of our spiritual sisters in next year’s bracket, please! Well…I had to ruminate on this one…but finally decided to go with Mary Magdalene (despite one of my childhood memories that features a tattered WWI-era sheet music edition of “Jeanne d’Arc, they are calling you…”) — “Apostle to the Apostles” has always gotten me, and the Johannine account is stunning. Mary Mag, it is! My email arrived at 12:10 PDT. Just sayin. . .
Love Jeanne, but had to go with Mary. This is getting tough. Fill out your brackets today! Post your picks in a Facebook note! Wagers are up to your own informed consciences and devising. I put off voting in hope of hearing voices in guidance but no name have I heard other than those above. Maybe another hour. I love Joan’s quotes! Mary stood in the presence of the Risen Lord Jesus. She saw him, she heard him speak. She was not allowed to touch him. Both women obeyed instructions from God. I vote for Mary, standing in the Presence. I love Joan’s saucy attitude “I was born to do this” and “in one better than yours!” two circles and a snap!! I decided to put aside all the silly stories about Mary and just look at her as a faithful follower of Jesus. I did a quiet day for some folks a couple of years ago and I used this icon of Mary. It was a total hit. Gotta go with Mary. Golden Girl with a trusty rusty sword or Magical Egg Lady who might have lived in a cave for awhile? The kids followed Father Goldacker’s advice and voted for the Easter Egg Lady. Oooh, one of my favorite songs! Thanks for quoting it!!! Saw the glory in her eye. I thank Leonard Cohen for this song of pathos (and so many more); I voted for Mary Magdalene. I didn’t get my email today either. Did you just let the boys vote? In Christ, there is neither male nor female. So it is with internet glitches too. See above. It seems that internet gremlins (possibly sent at the behest of humorless Christians) ate all or most of the emails. Sorry! Best idea is to visit http://www.lentmadness.org every day just after 8:00 a.m. EDT and cast your vote, whether or not you get an email. I vote for Mary, you go girl! She is a bigtime favorite of mine! 1 Trackback to "Joan of Arc vs. Mary Magdalene"